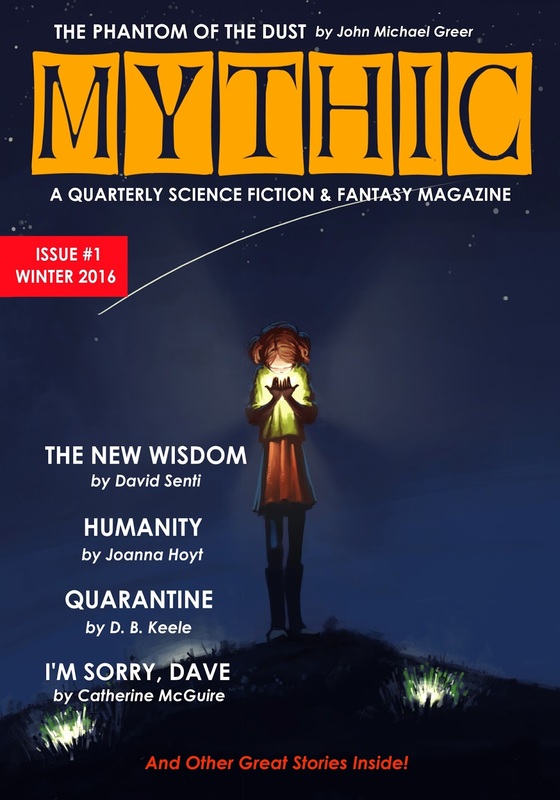 I am happy to report that next month will mark the release of the third issue of MYTHIC: A Quarterly Science Fiction & Fantasy Magazine. We've gotten off to a great start and I've had the privilege of showcasing some great writers. I want to keep doing that and more. This is where some of you come in. We are on the hunt for subscribers. As a fledgling magazine, I've had to run things very lean and on a shoestring budget. My thanks again for those who supported us even before the first issue appeared by subscribing. Now, I hope to win addition support from all of you by continuing to select quality and entertaining stories to fill each and every issue of MYTHIC going forward. I know this will take time--nature of quarterlies I think--but I believe it will happen. One of my main goals is to increase compensation for the writers. That's crucial for me. After all, I'm a writer too. Beyond that, are the other costs of the putting together each issue. I hope that as we gain more and more subscribers I can improve all aspects of MYTHIC. To find out more, visit our SUBSCRIBER PAGE. Note: For those who support our endeavors can also donate using the button on our site for one time contributions. Those kind enough to provide ongoing support may do so via Patreon.